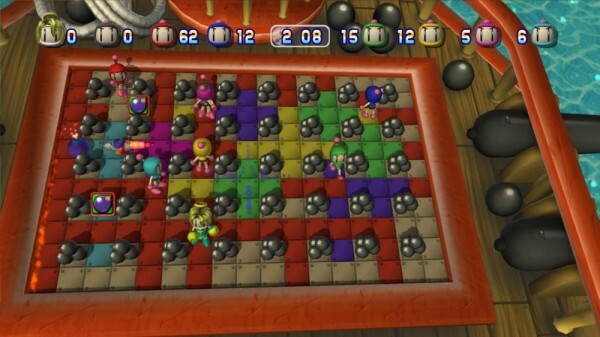 In Bomberman Live: Battlefest players control a Bomberman in an arena filled with hard and soft blocks. The object of the classic battle mode is to drop bombs to blow up the enemy Bombermen. Soft blocks can be destroyed by bombs and give basic power ups that increase the length of the fire, the amount of placeable bombs, and player speed. There are also more complex powerups like the ability to punch a bomb three spaces, a special bomb with fire that passes through all the soft blocks in its range (instead of only hitting the first one), or a bomb placed in a rocket that blows up on impact. 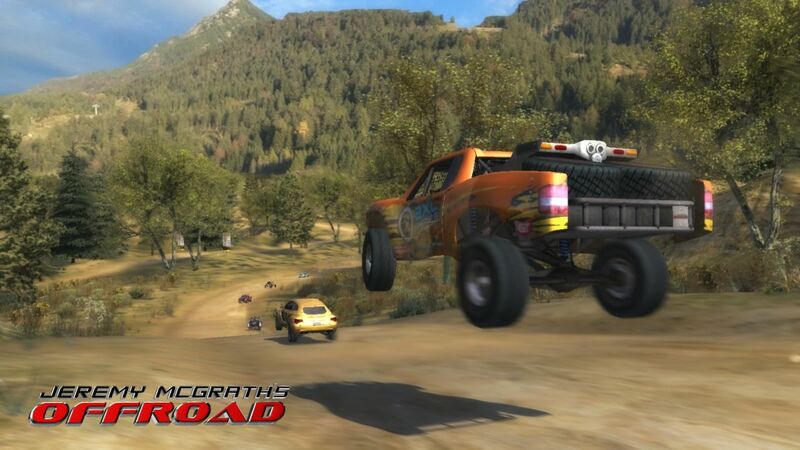 The premise is simple but there are many gametypes including capture the flag, bomb paint modes where players blow up bombs to claim squares, and the new bankroll mode where players buy powerups with gold before the match starts counter strike style. Team variants exist for most of the modes as well. 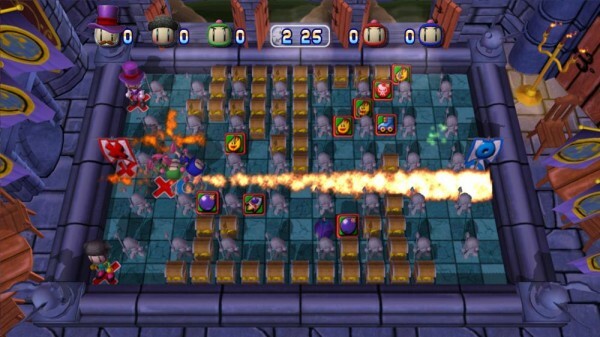 Something for everybody – Bomberman for the most part has always been a game of blowing up the other guy and that’s it. Bomberman Live: Battlefest builds off the tried and true formula to provide tons of game modes. Six free for all modes and six team modes make for a large diversity of explosive goodness. Some of the modes like Capture the Flag and VIP are more objective, bringing classic first person shooter gametypes to the Bomberman world and making them work. Some free for all modes are more about preservation and guile, using strategy to protect your blocks in Paint Bomb or deciding when to spring for that expensive power-up in Bankroll. Classic Battle mode is fun for everyone on its own, but all the other options blow Bomberman above and beyond. Somewhere for everybody – To accompany the flurry of game modes is a large selection of maps, made even larger by DLC. Most of the maps have a gimmick which can be toggled (some of the gimmicks are lighter and sillier, some are challenging) that gives each map some personality beyond the plethora of interesting settings chosen for the maps. A very arcade style action game such as Bomberman needs awesome maps to spice up the experience and the gimmicks ensure that no two matches will play out the same. Accessible, strategic action – Blow up blocks, get power-ups, watch out for explosions and nuke your friends; it’s pretty simple stuff. While the strategy takes getting used to when it comes to implementation, what needs to be done is very obvious. Since most of the time any player’s strategy is based off of their current arsenal and the amount and location of remaining blocks, figuring out what the next best move is simple. All the icons are clear and game controls allow new players to ease their way into the full Bomberman repertoire going from simple power ups, to power downs and eventually throwing everything in with the dreaded skulls as well. Silly customization – Customization is always fun in these sorts of games, so thankfully Bomberman has plenty to go around. While running about the top-down plane of a Bomberman match, after a certain amount of time has passed a glowing polygon of untold fanciness appears floating somewhere on the map. By collecting these sparkly bits of wonderment, players unlock one piece of either head, body or face equipment which they can mix and match to give their Bomberman some style. Can’t go wrong here, the sets look nice and yet work well when working with other set pieces. Control over games – Starting a game of Bomberman means picking the gametype, maps and whether or not to turn on gimmicks, choosing the amount of players and bots and bot difficulties, then setting match rules like time limit, whether or not a defeated player’s power-ups are scattered to the map and other nifty features, and finally controls over power-ups such as which appear and whether or not they can be destroyed by fire. That’s a lot of fancy doodads resulting in plenty of ability to tailor the game to your liking. Bomber-bots – Surprisingly or otherwise the bots in Bomberman are pretty competent depending on what difficulty they’re set at. A normal bot will be about the skill level of the average Bomberman player and at hard they start going for traps and setups like an experienced player. Just having them is nice, but the fact that they can be actual competition is awesome. Few improvements over the original – Bomberman Live: Battlefest is indeed great fun but not much was done beyond adding power-ups, maps and modes for the sequel. This is disappointing as there’s room for expansion with so simple a gameplay formula, luckily what’s there is fun and replayable. Too modest in appeal – When starting up the game all players get is a start screen and some basic menus and a picture of the signed-in players’ Bombermen. From there, there’s online and offline, customization and leaderboards, no other nifty bits or minigames or flair to give Bomberman a sense of style other than the menu design, which isn’t all that great. It doesn’t hurt the game’s performance necessarily, but it does give an air of plainness to itself that likely hurts its first impressions. 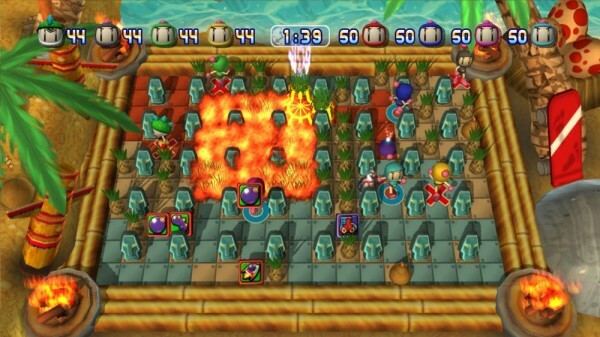 Just the multiplayer – Bomberman in the past has had a single player mode complete with worlds and set pieces akin to that of games like Super Mario. Players fought several types of enemies with different behaviors, patterns and abilities which made any given level a bit of an action-puzzle. The gameplay was fun and provided some sense of progression beyond just unlocking bits of customization. Unfortunately this game doesn’t take advantage of that sort of feature, and would present a much fuller experience if it did. Bomberman Live: Battlefest is full of frantic action, subtle strategies and tons of replayability. 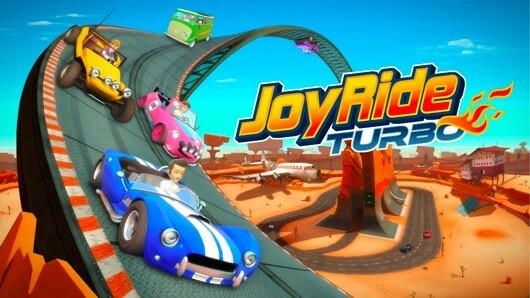 That being said, arcade-style games like this don’t appeal to everyone and the lack of a single player means it fills the role of the thirty-minutes-at-a-time game, a role at which it excels phenomenally. A little Bomberman now and then will be tons of fun, especially when friends are over to play games or watch a movie or just to hang out. With solid mechanics and plenty to setup when going into a play session, Bomberman Live: Battlefest will jump to the forefront of your mind anytime you’re looking to kill time with your buddies.